BANG! With one shot, on July 11, 1804, Aaron Burr fatally wounded Alexander Hamilton in a duel. Hamilton died the next day. Who is this Founding Father slayed by a fellow politician and today's ten-dollar man? Over the course of the last several months, the name Hamilton has been hot. Really hot. The wildly popular Broadway musical, "Hamilton" based on the biography by best-selling and Pulitzer Prize-winning author Ron Chernow, has pushed our nation's first Secretary of the U.S. Treasury into the the public consciousness. The musical is the first-ever cast album to reach No. 1 on the Billboard Rap Album chart, it won a 2016 Grammy award for Best Musical Theatre Album and 11 Tony awards, including Best Musical and Best Original Score. The statue of Alexander Hamilton on display in the Rotunda of the U.S. Capitol emphasizes his role in the framing of the new nation's government. Hamilton, the man, was born in the 1750s on the island of Nevis in the British West Indies. He was the product of an adulterous affair, was abandoned by his father as a baby, and grew up impoverished. At 16 years old, Hamilton arrived in New York, thanks to generous patrons, to study at King's College. In the 1770s the American colonies were on the brink of revolution and a young Hamilton was drawn towards politics and began supporting the Patriots' cause. In 1775, when the Revolutionary War began, Hamilton joined the New York Provincial Artillery Company. He rose to the position of aide-de-camp to General George Washington and later led a victorious charge against the British at the Battle of Yorktown. Hamilton would go on to heavily influence ratification of the Constitution through his collaboration with James Madison and John Jay. The three men published essays, collectively known as The Federalist Papers, to explain and defend the newly drafted document. A panel on the Senate Doors featuring Alexander Hamilton at the Battle of Yorktown. A proponent of a strong centralized government, Hamilton's economic policies supported that philosophy. He had the federal government assume states' debts, instituted a federal system for tax collection and helped the United States establish credit. Hamilton's influence on the newly formed United States is quite remarkable. In Washington, D.C., Hamilton's contributions are celebrated with a bronze statue at the Treasury Building and he can be found in exhibits at the Smithsonian's National Museum of American History. Still in need of your Hamilton fix? At the U.S. Capitol, there are five pieces of art depicting Hamilton. Howard Chandler Christy's Signing of the Constitution, located in the House east stairway, is likely one of the most-recognized pieces of art at the U.S. Capitol. Another frequently viewed piece of art featuring Hamilton is Horatio Stone's marble statue located in the Rotunda. The pedestal of the statue is distinctive with its incised symbolic scene on the front of the stone. Constantino Brumidi's Washington with Jefferson and Hamilton. Lesser known works of art featuring Alexander Hamilton are the fresco mural and fresco portrait by legendary artist Constantino Brumidi. 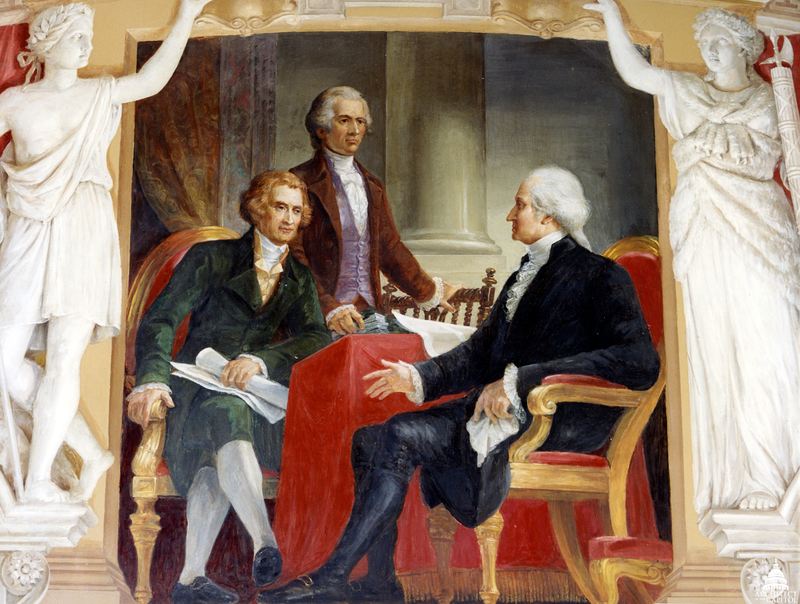 The mural, Washington with Jefferson and Hamilton, is located in the Senate Reception Room and the portrait (cover photo) is in the President's Room. 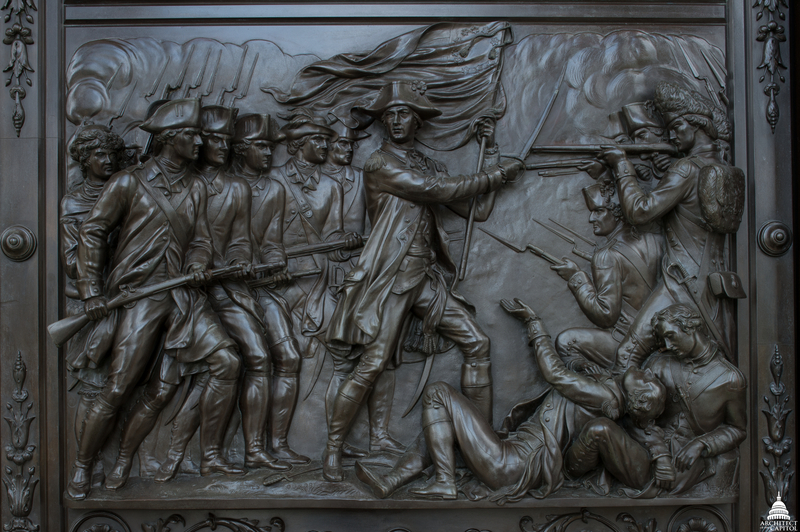 Perhaps the least recognized art featuring Hamilton in the Capitol Building is Storming the Redoubt at Yorktown a bronze panel on the ornate Senate Doors. Designed by Thomas Crawford and executed by William Rinehart, the door panel depicts a scene at the end of the war when British General Charles Cornwallis is entrenched at Yorktown, Virginia. General George Washington granted Hamilton permission to storm one of the two redoubts needed for the Patriot's victory. Cornwallis would eventually surrender 8,000 British soldiers and seamen to the Americans. The door panel includes Hamilton fearlessly leading the attack. 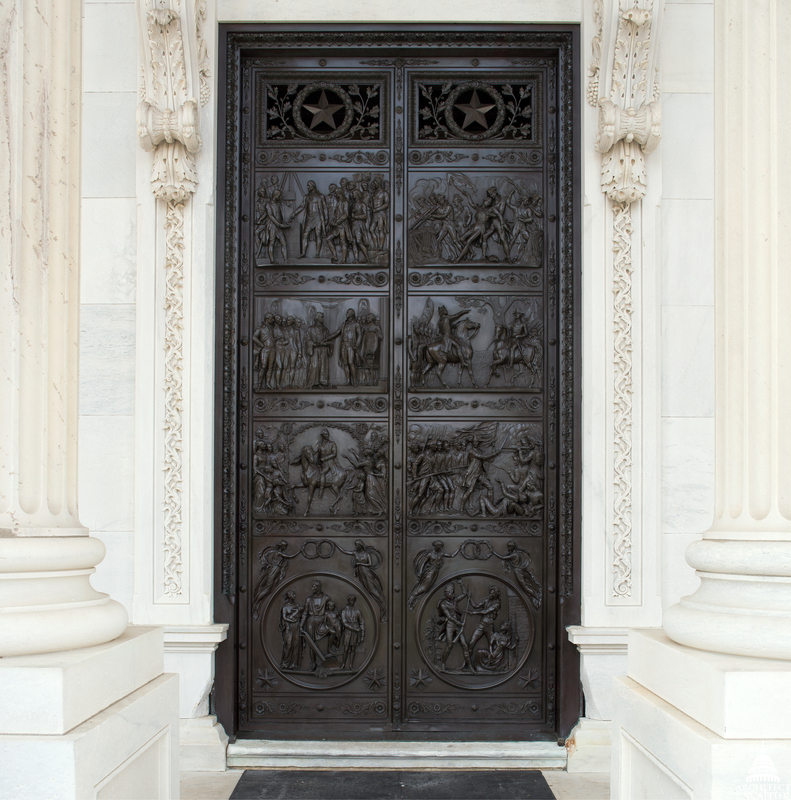 Senate Bronze Doors designed by Thomas Crawford located on the East Portico entrance of the U.S. Capitol Building. With the recent Kennedy Center announcement that the award-winning musical "Hamilton" is coming to Washington, D.C., the options to explore and experience one of our Founding Fathers in our nation's capital has never been better.